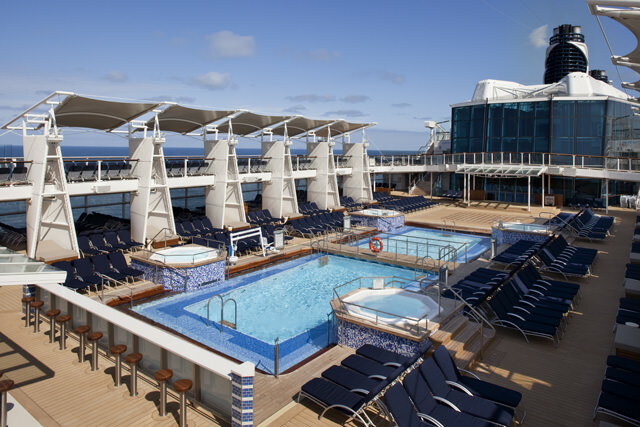 Celebrity Solstice, launched in 2008, was the first vessel in the Solstice class, and the model on which all the others were built. 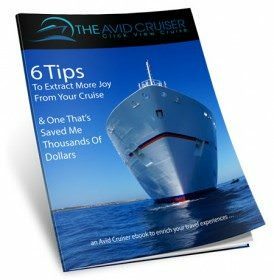 Measuring 122,000 gross tons and carrying 2,850 guests at double occupancy, she’s a huge but exceptionally well laid out vessel with an interior design that really flows from room to room, creating a unified feel. The ship’s DNA is firmly rooted in Celebrity’s older ships, with their neo-deco lines, rich textures, and collections of minimalist art. 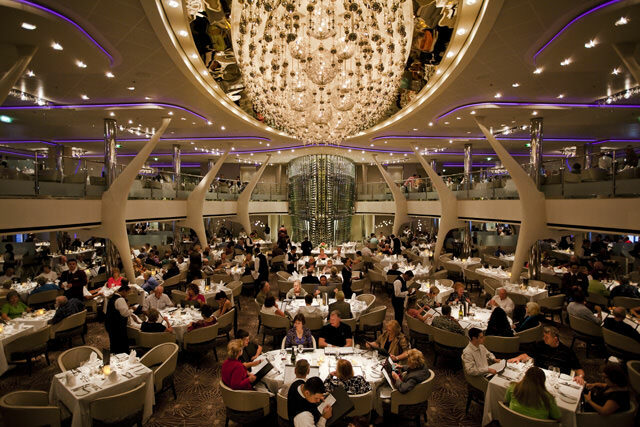 But in re-imagining itself for the future, Celebrity went several steps beyond, employing some of the best designers in the business to create spaces that are both knockout gorgeous and full of great little details that add greatly to the cruise experience. Solstice’s most distinctive feature is definitely the Lawn Club, a half-acre of real grass perched at the very top of the ship and offering a quiet, country-club feel. Guests can play croquet, putt around some golf balls, play a game of bocce, or take a little picnic. At one end of the space, the world-famous Corning Museum of Glass has created a studio to present Hot Glass Shows, in which master artisans explain the art of glass-blowing during creative, high-energy performances centered around creating a finished vase, bowl, or other item. A couple decks down, Solstice’s pool deck is one of the most serene and resort-like in the cruise industry, its two pools surrounded by 25-foot A-frame canopies that have luxurious day beds at their bases and large cantilevered awnings up top, providing shade for chaise lounges spread out along two decks. Forward of the pools is a glass-ceilinged, adults-only Solarium offering a lap pool, cushioned teak lounge chairs, and a super-relaxing atmosphere. Inside, Solstice feels like a spread in an upscale lifestyles magazine. At the base of her atrium, translucent, backlit onyx panels and white drapes give a Miami hotel ambience, while fifty feet up a full-size, 20-foot tall tree sits suspended in a planter, adding a hint of surrealism. The ship’s AquaSpa is done in beautiful minimalist style, all clean lines with soothing white and Aegean blue color scheme. Besides massages, facials, and other traditional treatments, the spa menu includes acupuncture, teeth whitening, Botox wrinkle treatments, and other trendy options. In all, Solstice offers five restaurants plus a buffet and several snack and light-meal options. The main restaurant is the Grand Eperney, designed in dreamy white-and-crystal Hollywood style by celebrity designer Adam Tihany. Another Tihany design, the Tuscan Grille, is an upscale steak-and-pasta venue. Silk Harvest serves a mix of Chinese, Thai, Vietnamese, and Japanese dishes, complemented by sakes and specialty cocktails. After dinner, guests can head forward to the 1,115-guest Solstice Theatre, which was designed with a rounded stage to bring performers closer to the audience, plus complex gear up above that lets aerialists fly out over the audience’s heads. Solstice’s staterooms are an evolution of the standard cruise cabin, from their shape and ergonomic design to their thoughtful details and amenities. In all, Solstice offers private balconies on 85% of her cabins, and each is big enough to fit two deck chairs and a table. Inside, in each standard stateroom, one wall bulges outward to give more maneuvering room around the foot of the bed, whose mattress is designed with rounded corners to make moving around it even easier. Beds are also higher than normal, allowing more luggage storage beneath, and are surrounded at the wall by a tall headboard that has an unobtrusive little cabinet that’s perfect for purses and other small items. In the bathrooms, the shower stalls are larger than the cruise ship norm and have little foot rails that make it easier for women to shave their legs. There’s also a nice collection of little drawers, cabinets, and other nooks for storing toiletries. Between her standard stateroom categories and her suites, Solstice offers a middle ground in the form of her 130 adults-only AquaClass staterooms, which promote a “wellness” experience through things like special music/sound and aromatherapy options, jetted bodywash showers, pillow menus, and perks like free use of the spa’s Persian Garden aromatherapy steam room and relaxation room, and access to the wellness restaurant Blu. 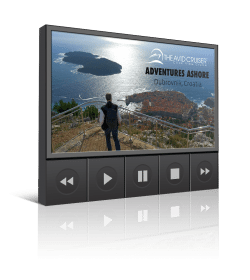 Avid Cruiser Posts, Photographs, and Videos Featuring Celebrity Solstice.